At the village! Ski resort! Restaurants and Golf! 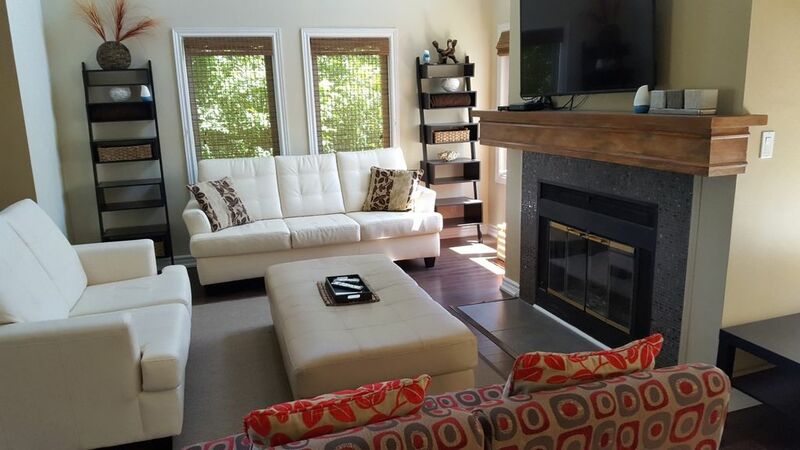 Exquisite, modern three bedroom condo at Mountain Walk development, across the road from the Blue Mountain Village, ski hills and golf course, can accommodate up to 8 people and features beautiful kitchen, two and half baths and wood fireplace. Master bedroom has a king bed, and two other bedrooms have queen beds. Beautifully decorated with tons of upgrades and perfect location this condo offers best of both worlds. Perfect vacation getaway with all amenities of modern living. The unit comes with all linens and pillows! Second Floor unit!! so it comes with great views of the village and ski hills! There is a fireplace in the main room where you can set a cozy fire! Take a walk across the street into the Village and find a small grocery store. I like the property, overall. It was very close to the ski lift. I utilized ski valet, so it made it easier for me not to carry skis on daily basis. It's close to restaurants, grocery stores, etc. It was clean, and well kept. It had washer and dryer which was a huge plus if you have large family. Wood burning fireplace was wonderful. Easy parking. Check-in and Check-out went without any problems. It is well equip with dishes, utensils, grill, etc. Few minor points. I felt nonstick pots and pans had too many scratches and needed updating. We purchased our own shampoo, and other minors things. Other than that, it was very comfortable. I would visit again in future. We had a great time during our vacation in this wonderful cottage. Brent is really nice. It's big enough for 5-8 group and very tidy yet the light is not strong enough. Only one thing is you cannot find hair dryer so pls remember to bring that if you need.